The Boeing 747 is a wide-body commercial airliner and cargo transport aircraft, often referred to by its original nickname, Jumbo Jet, or Queen of the Skies. It is among the world’s most recognizable aircraft, and was the first wide-body ever produced. Manufactured by Boeing’s Commercial Airplane unit in the United States, the original version of the 747 was two and a half times the size of the Boeing 707, one of the common large commercial aircraft of the 1960s. First flown commercially in 1970, the 747 held the passenger capacity record for 37 years. The 747-200B was the basic passenger version, with increased fuel capacity and more powerful engines; it entered service in February 1971. In its first three years of production, the −200 was equipped with Pratt & Whitney JT9D-7 engines (initially the only engine available). Range with a full passenger load started at over 5,000 nmi (9,300 km) and increased to 6,000 nmi (11,000 km) with later engines. Most −200Bs had an internally stretched upper deck, allowing for up to 16 passenger seats. The freighter model, the 747-200F, could be fitted with or without a side cargo door,and had a capacity of 105 tons (95.3 tonnes). The 747-300 features a 23 feet 4 inches (7.11 m) longer upper deck than the −200. The 747-300 first flew on October 5, 1982, and the type’s first delivery went to Swissair on March 23, 1983. Besides the passenger model, two other versions (−300M, −300SR) were produced. 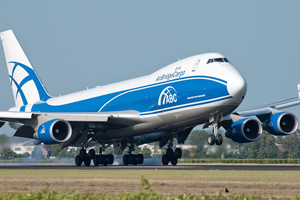 The 747-300M features cargo capacity on the rear portion of the main deck, similar to the −200M, but with the stretched upper deck it can carry more passengers. The 747-400, the most common passenger version in service, is among the fastest airliners in service with a high-subsonic cruise speed of Mach 0.85–0.855 (up to 570 mph, 920 km/h). It has an intercontinental range of 7,260 nautical miles (8,350 mi or 13,450 km). The 747-400 passenger version can accommodate 416 passengers in a typical three-class layout, 524 passengers in a typical two-class layout, or 660 passengers in a high density one-class configuration. The 747-100 was the original variant launched in 1966. The 747-200 soon followed, with its launch in 1968. The 747-300 was launched in 1980 and was followed by the 747-400 in 1985. Ultimately, the 747-8 was announced in 2005.